My nickname at the rabbit shows is 'Mamadutch'. I guess that's because I have raised and shown Dutch rabbits for over 25 years. Dutch are my favorite breed of rabbit. There is no other rabbit that can compare to a Dutch that is prime in coat and cobby in type! I raise all six varieties, but I believe that Blue is my favorite. I have a winning Blue line that originated from stock I acquired from Jill Dobson of California quite a few years ago. I have had many Dutch that have done well for me on the show tables, but there are two that are close to my heart. 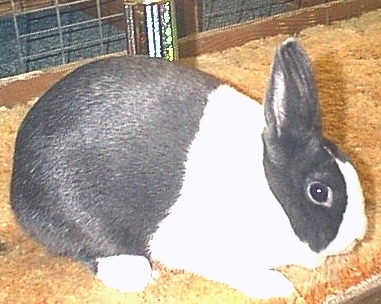 My first BEST IN SHOW with a Dutch was won by a sharp little black doe that I named JUDY'S U-GO-GIRL. She was fine! I only got two litters from her and then I lost her. That was surely a sad day for me. But her children and grandchildren are carrying on her legacy. This past 2001 show season saw the blue doe pictured top left taking the top honors ALL the time. JUDY'S DIVINE MISS D. acquired 27 legs of championship in our short 5-month show season down here in the south. You could hear the groans and grumblings from my competitors at the shows when they found out I had entered her. She was the winningest Dutch in the South this season! She is retired, now...much to the relief of my competitors. I find that very amusing! In June, 1997, three other Dutch-lovers and myself formed the Louisiana Dutch Rabbit Club. We strived to make our club a family-oriented organization and the best rabbit club in the South. We achieved that goal! We have beaucoup members and the numbers of Dutch being shown in the south are mighty! Dutch are taking more Best In Shows than ever before. 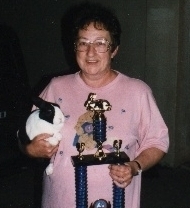 I am the current Secretary/Treasurer of the Louisiana Dutch Rabbit Club. To find out more about our club, please click the link below. If you would like to see more photos of my Dutch, and find out more about the Dutch rabbit clubs I am affiliated with, please click on the link below.